This is a photo I took years ago during one of our many trips to Paris when we lived in England. What a huge loss of beauty and history. Forever in my heart. It was such a fabulous building! Such a sad loss for us all! Such an immense tragedy for France and the whole world. This is a beautiful photo. I have been feeling such a strange sense of disbelief all afternoon. 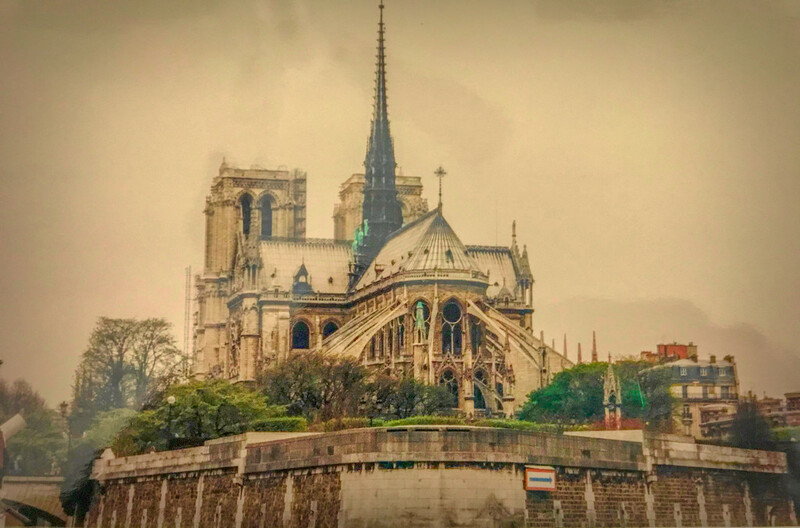 A little while ago I looked again at a framed photo I took of the cathedral 40 years ago on my one and only so far visit to Paris. A great shot to remember this beautiful cathedral by. Devastating news! A very sad day yesterday. We were there on Bastille Day in 2004 and had a chance to explore this magnificent cathedral. A tremendous loss. Great shot and it was so sad to hear of the fire. A perfect image. It will rise again as the heart of Paris shall not be silenced. I can remember standing in front of this majestic structure over 40 years ago, gazing up at the towers. Heartbreaking for the world. Lovely image. Lovely photo. Nice that you have the memory of how it was before yesterdays disaster. Such a beautiful image... the fire is so sad! !